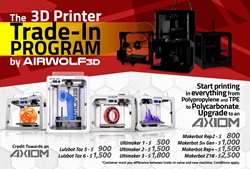 In response to growing demand for high-performance 3D printing, the new 3D Printer Trade-In Program by Airwolf 3D offers up to $2,500 trade-in credit towards a state-of-the-art AXIOM 3D printer. The 3D Printer Trade-In Program enables users to trade in old machines for credit towards a high-performance AXIOM 3D printer. Customers are coming to us because they want the advanced functionality of our 3D printers -- namely the ability to easily print 'difficult' materials like high-temperature polycarbonate and polypropylene or flexible materials like TPE and TPU. Printing polycarbonate is as easy as printing PLA...when you have the right 3D printer. Advances in 3D printing technology, such as the ability to print in high-temperature, engineering-grade materials like polycarbonate, are spurring 3D printer users to seek out solutions for upgrading their machines. As desktop 3D printers have evolved from a novelty into a high-performance tool, professionals and teachers are demanding greater functionality from their machines. Many professionals and educators have realized that they want to print larger objects in high performance materials, such as ABS, polycarbonate and polypropylene. The trend is seen largely in schools, where teachers tried to save money by incorporating lower-cost printers into their classrooms, but then, as their experience and knowledge grew, learned that their printer was not robust enough for educational use, such as for robotics programs, STEM competitions, and other engineering design projects. A number of entrepreneurs, engineers and businesses are now in a similar predicament. Many simply wanted to “try out” 3D printing without much investment and purchased an early lower-cost machine. Once they realized the value and potential of the technology, however, they have come to understand that their low-cost printer simply isn’t advanced enough to get the job done. "We're hearing this feedback over and over again," said Airwolf 3D Co-Founder/CTO Erick Wolf. "Customers are coming to us because they want the advanced functionality of our 3D printers -- namely the ability to easily print 'difficult' materials like high-temperature polycarbonate and polypropylene or flexible materials like TPE and TPU. The problem is they'd like to buy our printers, but feel stuck with another brand of printer that just doesn't cut it when it comes to more demanding applications. The 3D Printer Trade-In Program is our way of investing in a long-term relationship with these customers by helping them add a high-performance 3D printer to their workflow immediately." Demand for high-performance desktop 3D printers largely is driven by the need to print in engineering-grade materials like polycarbonate. The basis of bulletproof glass, polycarbonate is an extremely strong plastic that's widely used because of its high strength, chemical-, and temperature-resistance. Because polycarbonate is used so extensively in manufacturing, such as in the automotive, construction, and transportation industries, the ability to quickly 3D print prototypes in the material offers wide appeal. As a result, design professionals searching for a 3D printer that adeptly prints in polycarbonate have driven the trend towards more and more desktop 3D printers claiming to be able to print the material. But not all 3D printers are created equal. While a growing number of brands now claim to offer machines that can print in polycarbonate, those machines are either limited to producing small parts or they utilize polycarbonate-blend materials that are not as strong as pure polycarbonate. Airwolf 3D is the only brand of desktop 3D printer that has focused on offering an end-to-end solution for polycarbonate printing at a price point below $50,000. In 2014, the Southern California-based company was the first to release a commercial desktop 3D printer capable of 3D printing in polycarbonate. The company later began manufacturing its own polycarbonate filament in-house and released Wolfbite Mega, the only product of its kind to offer a safe and effective solution for preventing polycarbonate from warping while 3D printing. 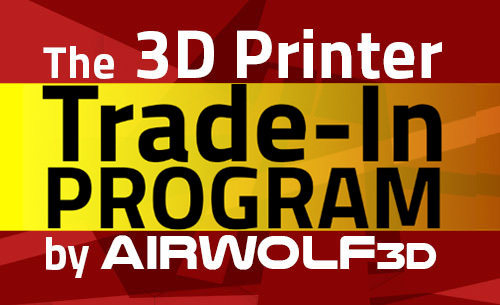 Consumers looking to upgrade their 3D printing capability are invited to contact Airwolf 3D regarding their eligibility for trade-in credit towards a new AXIOM 3D printer. At this time, the 3D Printer Trade-In Program is limited to specific brands and models of printers: Ultimaker 1, Ultimaker 2, Ultimaker 2+, Ultimaker 2+ Extended, Ultimaker 3, Makerbot Replicator 2, Makerbot 5th Gen, Makerbot Z18, Makerbot Replicator+, Lulzbot Taz 5, and Lulzbot Taz 6. To qualify for trade-in credit, trade-in printers must be in working condition. Airwolf 3D is committed to designing, manufacturing and selling 3D printers, 3D printer filament, 3D printing software, and 3D printing peripherals that are fast, affordable, durable and easy to use. Airwolf 3D has authorized dealers in more than 20 countries around the world. Airwolf 3D printers are delivered fully assembled and ready to print. All Airwolf 3D printers are manufactured in the company’s 12,000 sq. ft. facility in Fountain Valley, California. Airwolf 3D printers can be found in Fortune 500 companies, engineering firms, government agencies and schools worldwide. For more information on the best 3D printer in its class, please contact Airwolf 3D at (949) 478-2933 or email info(at)airwolf3d(dot)com. Free demonstrations are available at the company’s showroom located at 11208 Young River Avenue, Fountain Valley, CA 92708. The AXIOM series of printers by Airwolf 3D are optimized for printing engineering-grade materials like polycarbonate, polypropylene, TPE, and TPU.The AXIOM series of printers by Airwolf 3D are optimized for printing engineering-grade materials like polycarbonate, polypropylene, TPE, and TPU.